Equipment: satellite TV; DVD, stereo; internet access Wi-Fi (included); laundry drier; underfloor heating. Furnishing: good, pleasant, well-kept, tiled floor. Please note: Non-smoking house. Owner lives at floor 1. apartment, 2 - 4 people, 2 room/s, 1 bedroom/s, 1 bathroom/s, approx. 40 m², 1 floor/s, apartment on ground floor, south-facing location, separate access to the property, via external stairs. Kitchenette: Kitchen/ cooking equipment: 4 ceramic hobs, oven, microwave oven, refrigerator, freezer, coffee machine, water boiler, toaster, fondue set, raclette set. in the living room. Situation: hillside location, panoramic view, view of Grindelwald, Eiger Nordwand, Kleine Scheidegg. Plot description: 1 x garage. terrace 20 m², furnishing provided. Arrival: Airport Bern in approx. 70 km. Train station Grindelwald in approx. 1.4 km. Beach/waters: Lake in approx. 20 km. Bus stop: Bus stop in approx. 700 m.
Cable car: Männlichen, in approx. 1.8 km. Next village/town: Center Grindelwald in approx. 1.4 km. Interlaken in approx. 20 km. Public swimming pool: Indoor public swimming pool in approx. 1.4 km. Public outdoor swimming pool in approx. 1.4 km. Shopping: Next shopping possibility (Grindelwald) in approx. 1.4 km. Unforgettable location with astounding views! A jaw- dropping, pinch yourself, unbelievable view! Never got used to it! Woke up everyday in amazement and went to sleep every night in awe. The big 3- Eiger, Monch, and Jongfrau are smack dab in your face! We ate outside on our own terrace nearly every night because we found no restaurants that rivaled our views. The property is at the end of the street with only pasture lands to your right looking out so you feel you are truly out in the countryside- not in a suburb or the like. The hosts are friendly, very helpful and easy to work with. Their place was as comfortable inside as it was spectacular outside. Good kitchen, good bathroom, washer and dryer( a real treat! ), comfy beds and living quarters. We could hardly bear to leave it. 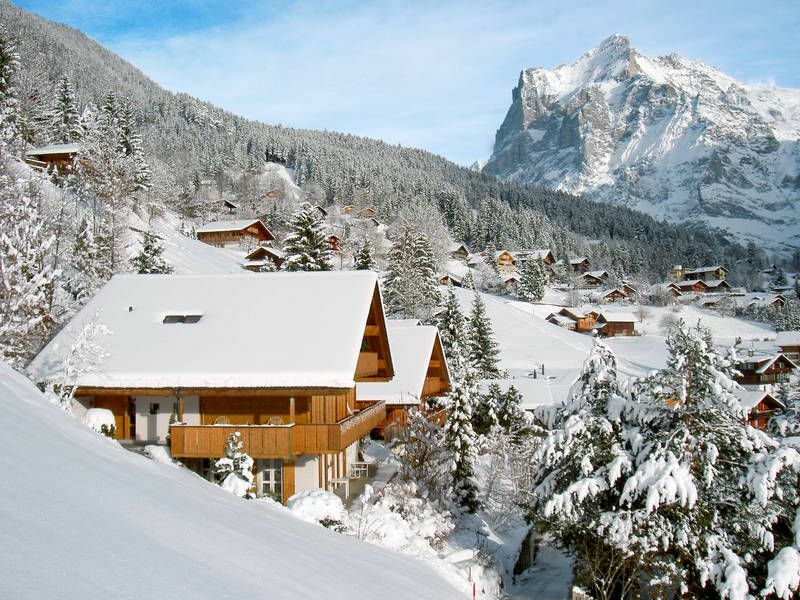 We can’t imagine a more perfect stay in Switzerland. Gut ausgestattete Ferienwohnung mit herrlichem Blick von der Terrasse auf die Eiger-Nordwand. Freundliche Vermieter, die uns immer mit Rat uns Tat zur Seite standen. Der Ortskern und damit alle Busse und Bergbahnen sind zu Fuß in 20min zu erreichen. Die Kosten für den Jungfrau-Travel-Pass sollte man auf alle Fälle einkalkulieren, denn nur mit den Ortsbussen kommt man nicht allzu weit.